“There’s always a first time!” That’s a saying each of us has come across at some point in our lives. Be it tackling a real life problem or a technical issue, there will always be something that we’ve never done before. And today our discussion revolves around one such technical issue – reformatting a Mac. While purchasing your brand new Mac did you consider the thought, that for some reason you might have to reinstall Mac OS X? Most probably, your answer to that would be ‘No’. And thus you wouldn’t have purchased a DVD from which to re-install OS X. Even if that thought did cross your mind, your next thought would have been that if such a situation arises, you will take the Mac to an Apple Service Center and get it fixed. Practically speaking, taking the machine to a service center is both inconvenient and costly. Also, sooner or later, you will want to reformat the Mac, be it because of an OS crash or because your machine has become too sluggish to work on. Though there are ways to boost up its pace but finding out the causes one by one and eliminating them is more time consuming than reformatting. Now, when you reach a situation where you want to reformat the machine at home, the question of having a DVD arises. And since you don’t have it, you land in a scoop! Worry not! Thankfully, Apple thought of this scenario before-hand and created a utility through which your Mac can be good as new again. 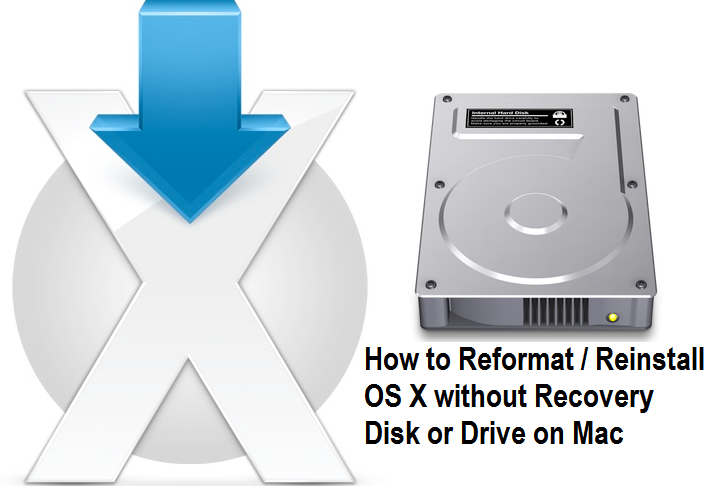 Here’s a step-wise process of how you can reformat your Mac OS X without a recovery DVD for manual installation of OS X Yosemite 10.10, OS X Mavericks 10.9, OS X Mountain Lion 10.8 and so on. This is the most important thing to do before you start the reformat process. This also acts as a perfect opportunity to clean up your disk. Delete all old, unwanted and unused files that are eating up disk space unnecessarily and save the remaining ones. You can save all important files through Time Machine or some OS X clone utility. Also, make a list of all installed applications so that you can download their setups and re-install them after the formatting is complete. Save any setup files that you already have so that you don’t have to re-download them. Once you are satisfied that you have backed up all necessary items, recheck them. Pay the most attention here because if you miss something out at this step, consider it gone forever! Then take a deep breath and restart the machine. Note: If you are not able to see the OS X Utilities window displaying the above four options and your Mac boots to your desktop instead, restart and hold the key combination specified above for a little longer than you did the last time. Do not leave the keys until you see the Apple logo. When you reach the OS X Utilities window, click on the Disk Utility option displayed on it. Another window will pop up listing the drives on your machine on the left and a volley of things you can do on the right. Select the hard drive where you want to install the OS X and then click the Erase tab on the right. Then follow the instructions to erase your hard drive. Once erased, exit the disk utility. Moreover, to better clean your Mac hard drive, you can install third party software tools as well, such as CleanMyMac3, which is very useful for cleaning up Mac hard disk. Re-installing OS X without a recovery DVD requires downloading it from the Apple server. As such, you need to make sure you are connected to the Internet before you proceed further. For this, you can either plug in an Ethernet cable to the machine or connect to a Wi-Fi network by clicking on the Wi-Fi menu in the upper-right corner of the screen. Select and connect to a preferred network. After you exit the Disk Utility window you will see the OS X Utilities window again. Now select the Reinstall OS X option. Follow the directions shown next and soon enough you will have a freshly installed copy of OS X. 1. The OS X Utilities window is a part of the OS X Recovery system pre-installed on each Mac machine. In case your Mac does not have this installed or if this has been corrupted or erased somehow, you will have to use the OS X Internet Recovery option. This option enables you to operate the Recovery directly from the Apple server over the Internet. You’re probably wondering how you will come to know if the pre-installed Recovery system is not present. Well, you don’t need to know. Your Mac will automatically connect to the Internet and start using the Internet Recovery if it is not able to detect the pre-installed version on your machine. 2. The Internet Recovery option will also need you to connect to a Network. Make sure an Ethernet cable is plugged into your machine or you are connected to a Wi-Fi network. 3. The time required to download OS X varies depending upon the version of OS X you are downloading and your Internet connection’s speed. 4. Make sure your Internet connection does not block the download of OS X. If you have some setting which is not supported by OS X Internet Recovery, disable that setting for the duration of the download and re-enable it later. 5. The OS X Recovery installed on your machine installs the most recent version of your operating system available. The Internet Recovery installs the version of OS X that your machine originally came with. Other than these steps and pointers, if by any chance you are not able to reformat your Mac, either purchase an OS X Recovery DVD or consult an Apple Service Center executive. But do give the process a shot from your end. It is pretty simple and can save your money.